Today's pitch comes to us from Vivian whom you may remember from previous pitches for other PBs in the Tomato Turner series - The Tomato Turner and Confessions Of The Tomato Turner). Vivian is passionate about picture books - her mission is to help children become lovers of books and reading. She's a former kindergarten teacher and a current grandmother of four. Although she always thought of herself as a timid sort of person, she's had some really BIG adventures. Two years ago, she went skydiving with her son. This May, she stepped out of her comfort zone again and took her first international flight to the 2013 Asian Festival of Children Content/SCBWI Conference in Singapore. In one of her presentations, shared her book, Show Me How! Build Your Child's Self-Esteem Through Reading, Crafting and Cooking,and spoke to parents and teachers about the importance of reading picture books to young children. Her goal is to write a picture book story that will have kids saying, "Read it again, please!" Last this year, she and her husband will be leaving the Colorado Rockies and returning to the East Coast to be closer to family. She blogs at Picture Books Help Kids Soar and you can connect with her on Twitter andFacebook. The Pitch: No matter how many times Peter counts the money in his piggy-bank, it's still not enough to buy the new bike he needs. The six-year old must find a quick way to earn some real money – summer vacation is only two weeks away and Peter wants to join his best friends' team when they compete in the annual bike relay race. Please send YOUR pitches for the coming weeks! For rules and where to submit, click on this link Would You Read It or on the Would You Read It tab in the bar above. There are openings in August so we're about ready for some new pitches! Send yours for your chance to be read by editor Erin Molta! Love the photos. 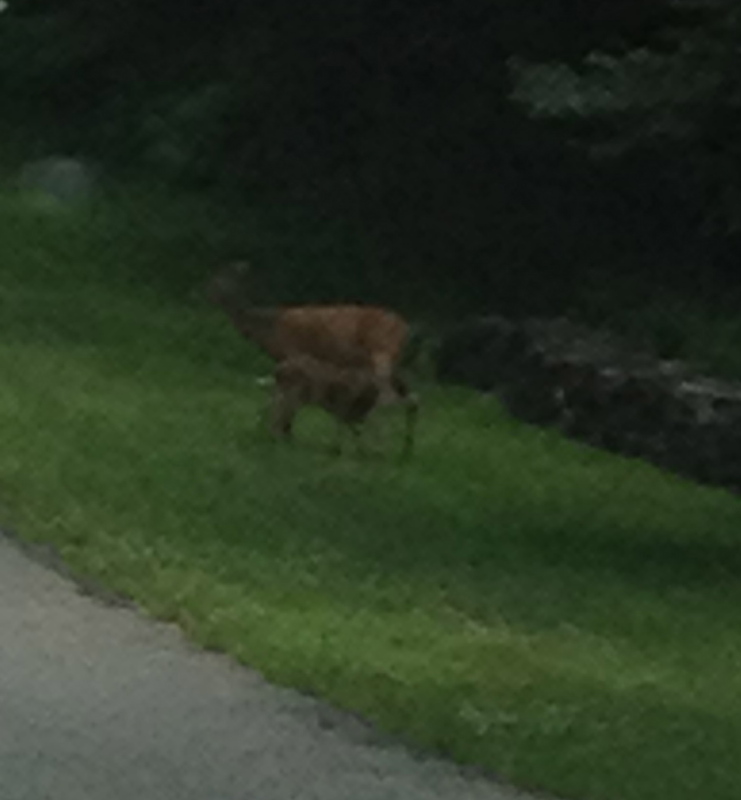 So much nature and beauty just the way I can handle it...at a safe distance lol! Summer vacation is only two weeks away. Peter wants to join his best friends' team when they compete in the annual bike relay race. But no matter how many times Peter counts the money in his piggy-bank, it's still not enough to buy the new bike he needs. The six-year old must find a quick way to earn some real money...(something short and sweet). The change may not be needed. Pretty good pitch. 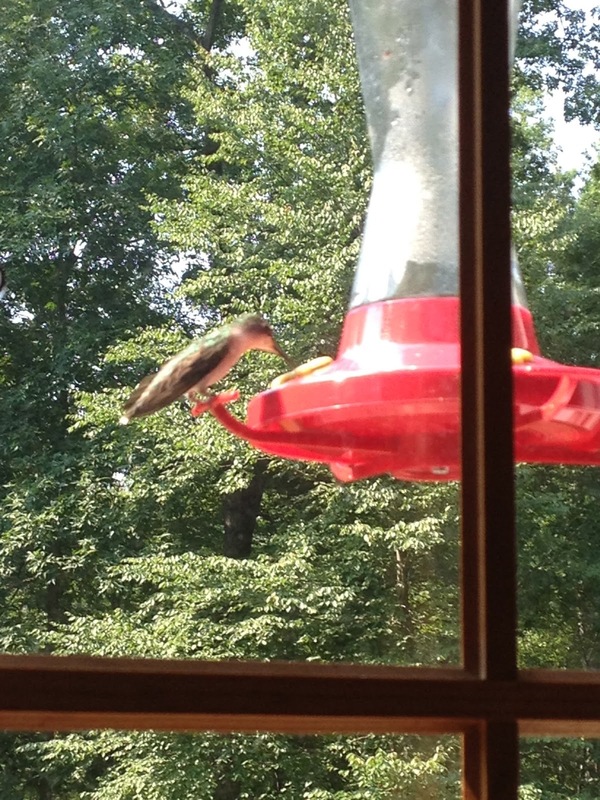 Love your pictures, Susanna! And Vivian's pitch caught me right away. Peter sounds like a real kid with a genuine problem to solve. I also think Angela's suggestions would make it a tad stronger. I would read it YES! thanks for the cookie - and the cute photos. We're having daily hummingbird disputes in the Monarda patch. The Tomato turner gets a job - I would absolutely read it. I would definitely turn the page to see what happens next, and want to know what kind of job this kid wants. Lovely pictures, Susanna! I love Vivian's story it sounds suspenseful and I agree that Angela did a great job shuffling the order a bit. I would possibly add the word fast right at the end. Good luck, Vivian! Those pictures are wonderful! What fun! Vivian, I think I would read this. A little more about what will happen when he tries to earn his money would help, though. I'm not totally sure what to expect for tone here, funny, serious, etc. I think I'm a maybe only because i'm not sure I know yet what the core of the book is about... I do like the shuffling Angela did to make the high stakes present at first. My other concern is that there is a disparity between the title (about tomatoes) and the pitch (about bikes). I'm assuming his job involves tomatoes, but is this random or something he's done before? I don't know how much a part of the story this is, so maybe it doesn't need to be in the pitch but then--does it need to be in the title? The title seems to describe to me a boy who loves gardening and finds a way to make gardening more than a hobby. But the pitch implies something different. So I might work on making them slightly more cohesive. Good luck! Thanks for sharing the pictures, Susanna. I think you have a great title for a PB with your Black Thumb! I admit I'd read anything from Vivian, but I enjoy 'little entrepreneur' stories anyway! I like Angela's shuffle too, though it could be tightened a tiny bit more (take out 'he needs' after bike). You might be able to squeeze in a few job suggestions, but as Rachel noted make sure we understand the flavor of this story too. Is it humorous? Heart-warming? Silly? Best of luck, Vivian, with this and the move too! I just love the pictures of the fawns. So cute! And the cookies look delish! I think starting the pitch with what he wants most (to be in the bike relay) would be more of a hook. I think you can leave out some details...like "summer vacation" and possibly "six-year old" could be left out, too. You many not want to be that age-specific in your story. I think you can go with Julie's suggestion of taking out "he needs" and, also, take out "new", because it isn't needed either. I like Angela's idea of shuffling and Julie's suggestion to give us more of the flavor of the story. Some cute, descriptive term about the piggy bank may be more fun than the counting...maybe only a couple of coins rattle as he shakes it...maybe it's not very heavy...maybe a coin drops straight to the bottom....maybe he lifts an empty piggy bank. Show us that the piggy bank needs a lot more coins to get that bike so that we just can't wait to read the story to see how Peter will come up with the money. Susanna I thought I had an animal menagerie going on in my neighborhood (and yard sometimes),oh but to see a humming bird in my yard would be neat! 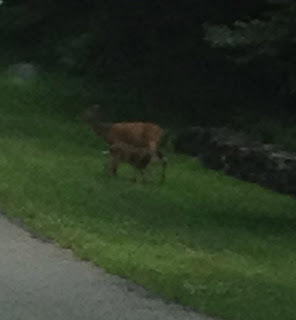 I saw a spindly fawn and it mommy on my way to work yesterday. I need a new phone. Enough about me. No wait! More cookies please. Susanna you know how new I am to writing and so my comment or question may be totally off base due to my ignorance in this matter. I'd read this story because I'd be interested to learn how Peter earns his money. I like the urgency of needing to earn money. I also like the way you made us want to feel for Peter's situation. But then (and this is petty) you use, "The six year old), which immediately distanced me from him. Not sure if I'm making sense. Again, I'd read this book. Yet, I am confused. My comment is more of a question to get an answer on how a pitch for a series work. Maybe this isn't the right forum, but I'm not familiar with the other Tomato stories. My question is, would an editor know about the character's association with tomatoes? Is that written in the bio as you've done in the intro? How does that work? It seems as if this story would be a laugh out loud read in seeing if and how tomatoes offer the mc an employment opportunity. But is this in the story or am I off base here? Now you see how I made Vivian's pitch all about me? 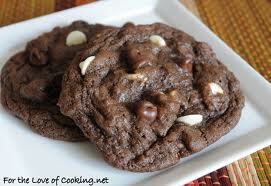 Why, yes, I'd love a double helping of the Triple Chocolate Chip Cookies! And yes, yes! I would read Vivian's book! (Have I put in enough exclamation marks yet?) It reminds me of a Beverly Cleary book...and a perfect boy book. I appreciate that, having 2 sons. The only thing I would suggest for the pitch, which is pretty nearly perfect, is to maybe give us a one sentence hint at how he might solve the problem or how it could potentially end, or maybe an intriguing question. Yes, so relatable. At least for me! When I was a kid, I spent a lot of time finding ways to boost the contents of my piggy bank. :) Also I'm intrigued by Vivian--a timid skydiver? There's a story there! So glad you enjoyed the nature, Angela :) and thanks so much for your helpful comments for Vivian! Glad you liked my less-than-expert photos, Linda :) and thanks so much for your thoughts for Vivian! Thanks so much for your very thoughtful comments for Vivian, Wendy. I am sure she will find them helpful! This is a great story premise. I love seeing stories where kids have a problem most readers can relate to that they can solve themselves. I would definitely read it. Yes to YA Dystopian, but a late-comer. Just working my way through THE HUNGER GAMES now! Vivian, you have a lovely flow to your pitch. But I would like to know more about the job(s) and the tone too. Does he try several jobs? Does he have any particularly fun/inspiring/daunting adventures when he finally gets the job? Or is the story really about the bike race? You've set up the story, but I'd love to know more of what it's about. Yes! School visits in a hooded cloak! Alright, at least a painted thumb! Yes I would read it. Great story idea and plot. Excellent pitch Vivian. I would like to know more about the job, but you may have revealed it in your title. If so, I would leave it as is. Wow! Nature AND chocolate on Blueberry Hill. Lucky you!! I love the nostalgic tone and premise of Vivian's pitch! I hope I'm not going to confuse the issue from other advice — successful pitches can go so many different ways. That said, I would suggest she start the pitch with some kid drama. "Peter needs money for a bike. Fast!" As Penny and others mentioned, Vivian could trim some words. I agree Rachel/Julie/Penny's advice to reveal the flavor/tone of the story in the pitch. She could use key words to easily convey Peter's entrepreneurial candor. My little next door neighbor uses the word "cash" instead of money. It makes me chuckle. Sounds like a cute story!! Good luck Vivian! Sounds like a good one to me. A good lesson for kids in saving and setting goals. The pitch is nice and tight. Any suggestions? I'm new to YA dystopian and am still catching up. Great pitch, Vivian. Yummy cookies. Delores...I appreciate your kind words about the tightness of the pitch...that means a great deal to me because I am usually so WORDY!!!! Penny...your insights and suggestions are going to help make this a much better pitch! Love the image of the coin dropping straight to the bottom. :) Thanks for your help! Julie...you are a dear! I am blessed that people of your writing caliber say they would read anything I wrote...oh my goodness. :) I appreciate the suggestions and will take them to heart! Hi Susanna, What beautiful wildlife! As for Vivian's pitch, yes I would read it! It sound like a story kids can relate to, and is a real-life problem. I wonder if there's a way to tease the reader with some of the things Peter tries to earn money so we get a sense of the mood of the piece? Good luck! You have one smart kiddo, Vivian! That’s what…400% profit? (Such an English major.) A great basis for a business—and a PB! Are you kidding? I lurrrve long reading lists. Thanks, Susanna! Hee, hee, this is the first but hopefully not that last time someone says something so fine about my writing! I'll cherish this, Vivian! There really no rules you can't break in this biz; good luck with the story, Vivian! I'd like to know what he does to attempt to earn the $. This way, I'll know more about Peter. I know what he wants. I know what's preventing him from getting it. Now I need to know what he does, so I know the plot. Good point, Theresa! I'm sure Vivian will find it helpful. Thanks for chiming in! Yes, I would read it. The pitch is clear and concise and Peter's motivation is one we can all understand. I am left wondering what kind of job(s) he might try, but maybe that curiosity is good - it would get me to read the book! Would I read it? Give me an adorable cover with too amazing illustrations, and I'd be sold. The Pitch: The annual summer bike relay is only two weeks away, but no matter how many times Peter counts the money in his piggy-bank, it's still not enough to buy the new bike he needs to join his best friends' team. The six-year old must find a quick way to earn some real money! Wow! Looks like a great summer! 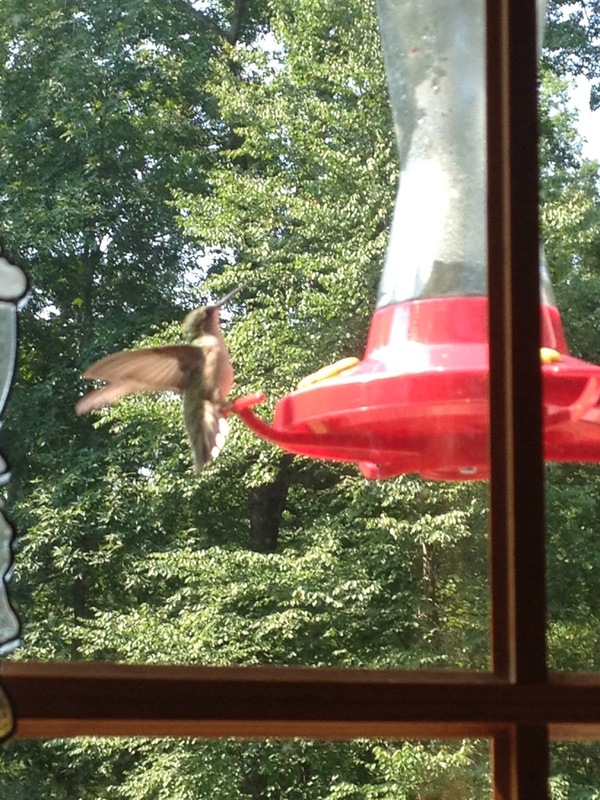 I love hummingbirds, and those deer are adorable. Must have been such a treat to see them. And on the subject of treats, you have any extra cookies? Because now I want some. The pitch sounds good, too -- like something that would interest six-year-olds because many of them are in similar situations. I always have extra cookie, Caryn :) Help yourself :) And thanks so much for your comments for Vivian! Thanks so much for your helpful comments for Vivian, Ruth, and I'm sorry this notification seems to have gotten lost in my inbox and I'm responding two weeks late!! Thanks so much, Caryn...so sorry I have been late to respond to your lovely comment. We are moving next month...and this month is devoted to...going through DECADES of accumulation. Thanks so much, Theresa...I'm going to see how to add a little about what Peter is planning, without giving away too much! Pam...you and others are looking for a little bit more about how Peter will earn his money...I agree it would add interest to the pitch...now I just have to figure out how to, as you put it, 'tease' the reader. :) :) Thank you so much for your help. The 4th Of July Secret Mystery Writing Contest!! !